Bake this easy cinnamon and brown sugar streusel-topped coffee cake in a square or round layer cake pan. Every bite of this moist coffee cake includes a generous amount of lightly spiced brown sugar streusel topping. Serve the cake slightly warm or at room temperature. It makes a light dessert with a scoop of ice cream or an easy breakfast or brunch treat. This coffee cake tastes delicious without embellishment, but feel free to add 1/4 to 1/2 cup of chopped pecans or walnuts to the streusel topping mixture. Or sprinkle some fresh blueberries on the batter before you add the streusel layer. You can prepare the streusel topping a few hours in advance or even the day before and refrigerate it in an airtight container until you're ready to bake the cake. Store the coffee cake in an airtight container in the refrigerator for up to one week or freeze it in heavy-duty freezer wrap for up to three months. Butter and flour an 8-inch or 9-inch square or round layer cake pan. In a small mixing bowl, combine 1/2 cup of brown sugar with 1/4 cup of all-purpose flour and the cinnamon. Stir to blend, then work in the 1/4 cup of softened butter with a fork or your fingers until the mixture feels crumbly. Set the streusel aside. In a medium bowl, combine the 1 1/2 cups of all-purpose flour with the baking powder and salt; blend thoroughly with a whisk or spoon, then set it aside. In a mixing bowl with an electric mixer, beat the egg lightly and then beat in the sugar and the 1/3 cup of melted butter. Add the milk and vanilla and blend well. Stir in the flour and mix the batter on low speed until well-blended. Sprinkle the brown sugar streusel topping evenly over the batter. Bake the cake in the preheated oven for 25 to 30 minutes, or until a toothpick inserted in the center comes out clean. Partially cool it in the pan on a wire rack. 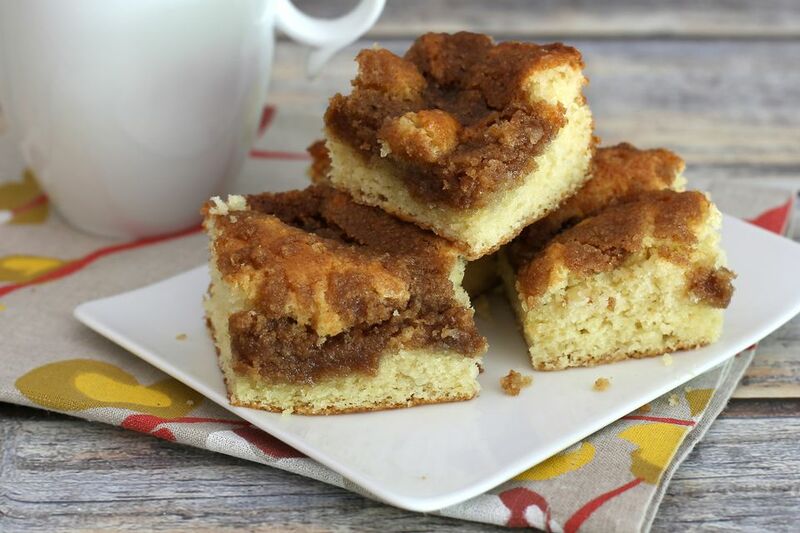 Cut the coffee cake into squares while it's still warm. Add 1/4 to 1/2 cup of chopped pecans or walnuts to the crumb streusel topping. Sprinkle about 1 cup of fresh blueberries, raspberries, or chopped fresh pitted cherries onto the batter before you add the streusel topping. Swirl 1/2 cup to 1 cup of jam into the batter before you top it with the streusel mixture. Add a handful of chocolate chips to the batter.